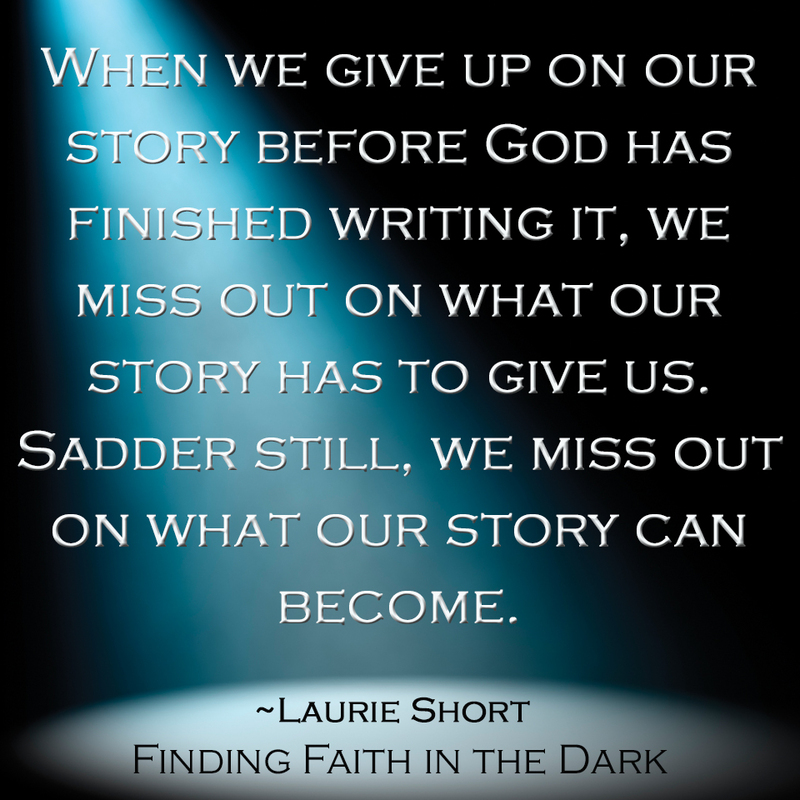 This quote is from Finding Faith in the Dark, which I am tempted to rename Finally Faith in the Dark, because it’s been a year since I turned it in. But I have learned that birthing stories takes time. Not just the ones we write. The ones we live. In our current society we have little patience for letting things unfold. It’s all about the instant click, the immediate result, the overnight shipping- which leads to a cliff notes version of life comprised of tweets and postings. But the best stories require simmering. In a sound bite life, there is no time for waiting. Or suffering. Or the richness that happens when you let the story unfold. But God’s stories require time to reach the fullness of what they’re destined to become. In Finding Faith, I have a chapter on God’s timing, and I open with a tongue-in-cheek commentary of the way God works. “Yes, that’s true,” God replied. “I guess so,” God said. I don’t know how it’s been for you, but God and I have never been on the same schedule. And I can count on one hand, if not one finger, the times when He is moving faster than me. Much of my life has been spent in waits that seemed to take too long. Until I look back and see what those waits produced. The other thing I’ve noticed is the best stories almost always get bad before they get good. But since we don’t have the time, tolerance or (often the) theology for the bad, we try to skip it. Or fake it. Or post the edited version. And we miss out on the texture those difficulties bring. A good story requires time and pain. That’s true in publishing and in life. You have to let the parts of the story come together. The good, the bad, the ugly, the confusing, and all the un-postable sound bites that eventually get edited and woven together to make the story what it is. So good stories need to be waited on. And the jewels come from how they are lived. So true. There are so many blessings in the waiting, but they are often hard to see. I find that most of them I don’t see until I look back. Then the strength and love of God’s hand is so clear. Blessed by your post. So excited to read the book! Oh yea, definitely sharing this, and definitely with my young Brother who practices “narrative therapy” (with Christ as his partner). As one who loves to “talk story” with others, this resonates with my “heyoka” heart.